Today I chatted about: The Puyallup SewExpo, www.sewexpo.com, is coming to town again and with it all the speakers, vendors, innovators, authors, and instructors from around the sewing world. My understanding is that this is the largest sewing world event of the year in the country and possibly the world for home-sewists. Listener Mary suggested SewBaby as well as Lamington Lane . I also have gotten them off ebay, from Serena, and Luscious Labels. Something interesting I have learned about myself is that Spring makes me sew. My machine can be dormant for long stretches but something about April causes me to make a skirt, dress, or something else to wear. I wonder if any of your listeners have noticed they also have seasonal stitcher’s itch (and if so, what season?). Alex Anderson was also chatting about it on her podcast, I think it was #50. I really enjoy her podcast, she interviews very interesting shop owners and more! Whether you quilt or not, take a listen. Her most recent podcast is about how to buy a new machine. So far my podcasters challenge is going great! Sage Tyrtle mentioned it on her podcast, Quirky Nomads. I know we can be so divided on political opionions but I am so pleased that we can come together as mothers and humans to give even a little love and hope to a child. Thank you Sage!!!!! If you’d like another great sewing podcast to listen to, check out Alex Anderson’s podcast. While she does focus on quilting, I think there is a lot to learn from her sewing experience and she has a great voice for podcasting! Check out the free Ottobre tank top for a fun addition to the summer wardrobe for the kids. If you’d like a direct link to the .pdf version, click here. Sister Diane from Crafty Pod is knitting up in Second Life and I’m thinking of logging in again. Here is my ‘brand new’ serger! Sewzanne’s Fabrics is offering a discount to Material Mama listeners. If you use the coupon code MM5, you’ll get 5% off your total order! Plus they discount shipping if you’re ordering just patterns. If you get a moment, please leave me feedback at iTunes. I appreciate and read each one!I sell sewing advocacy items and I also have a PayPal donation link here. I enjoy listening to your podcast. 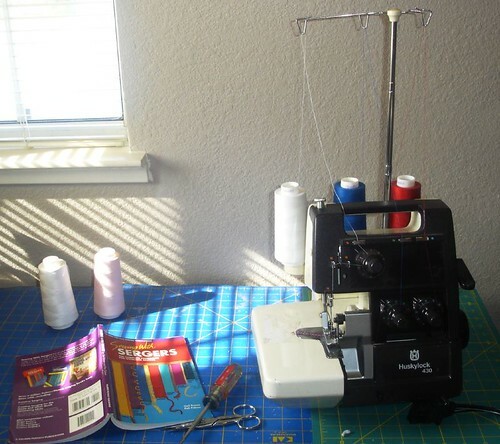 I just had to tell you I have a Huskylock 530 serger that I got 14 years ago. It is very similar to yours only 4 spools. The thing IS a workhorse and won’t die (as much as I’d like it to sometimes!) Anyway, keep the podcasts coming. It’s so nice to have someone “talk” to me while I sew.